This flyer was handed out by the Danish Truth Movement, i11time (in the 11th hour), at their demonstration at Copenhagen City Hall Square on September 11, 2009. The flyer is handed out at similar demonstrations, lectures, and other arrangements. The flyer is available here as a replica with illustrations. It can be found in numerous versions, e.g. on the Internet usually without consignor. 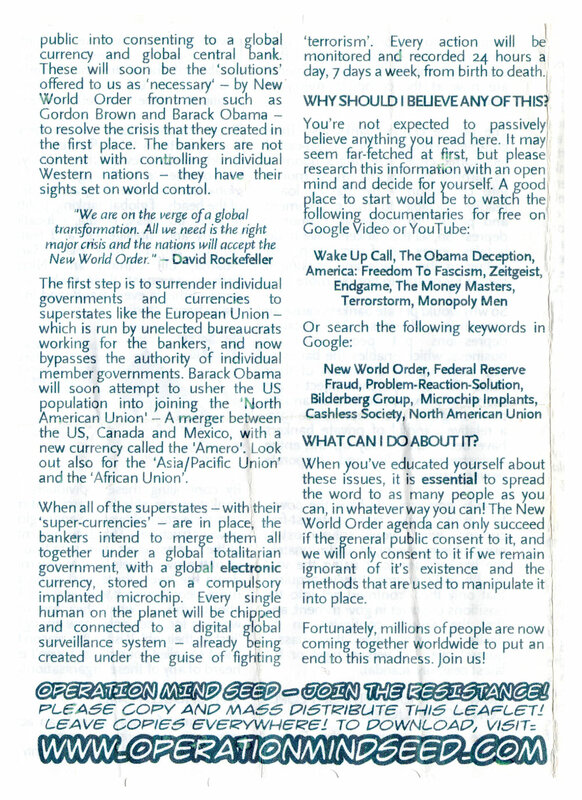 This version which was handed out by David Schmidt0, leading member of the Danish Truth Movement i11time.dk, has the website OperationMindseed.com as consignor. The website has only been active for a short while and the content has subsequently been removed1. 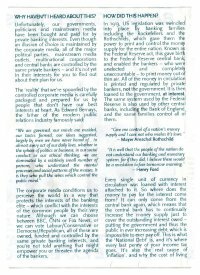 The corporate media conditions us to perceive the world in a way that protects the interests of the banking elite – which conflict with the interests of the common people by their very nature. Although we can choose between BBC, CNN or Fox News, or we can vote Labour/Conservative or Democrat/Republican, all of these are owned, funded and controlled by the same private banking interests, and you’re not told anything that might empower you or threaten the agenda of the bankers. In 1913, US legislation was swindled into place by banking families including the Rockefellers and the Rothschilds, which gave them the power to print and control the money supply for the entire nation. Known as the Federal Reserve act, this gave birth to the Federal Reserve central bank, and enabled the bankers – who were unelected and completely unaccountable – to print money out of thin air. 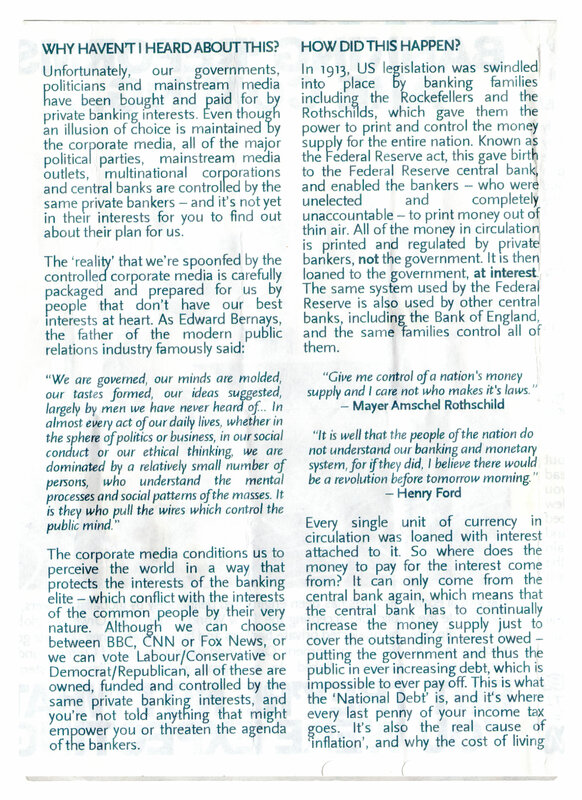 All of the money in circulation is printed and regulated by private bankers, not the government. It is then loaned to the government, at interest. The same system used by the Federal Reserve is also used by other central banks, including the Bank of England, and the same families control all of them. Every single unit of currency in circulation was loaned with interest attached to it. So where does the money to pay for the interest come from? It can only come from the central bank again, which means that the central bank has to continually increase the money supply just to cover the outstanding interest owed – putting the government and thus the public in ever increasing debt, which is impossible to ever pay off. This is what the ‘National Debt’ is, and it‘s where every last penny of your income tax goes. It’s also the real cause of ‘inflation’, and why the cost of living continues to skyrocket, while wages remain the same. As a result of this cosy little arrangement, governments are now at the complete mercy of private bankers. The private central banks also have complete control over the so-called ‘economic cycle’. Creating a boom is as simple as injecting more money into circulation – by making loans readily available to the government and public. To create an economic depression, all the bankers have to do is take money out of circulation – by calling in their loans and making it harder for people to borrow more. So why would private bankers cause an economic depression? Because depressions put people out of business, which enables the banks to buy them up for a fraction of their value. 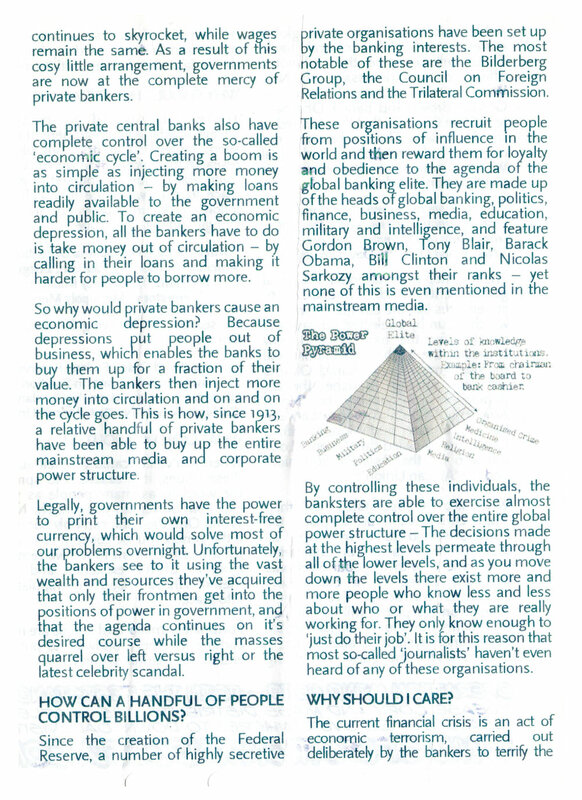 The bankers then inject more money into circulation and on and on the cycle goes. This is how, since 1913, a relative handful of private bankers have been able to buy up the entire mainstream media and corporate power structure. Legally, governments have the power to print their own interest-free currency, which would solve most of our problems overnight. Unfortunately, the bankers see to it using the vast wealth and resources they’ve acquired that only their frontmen get into the positions of power in government, and that the agenda continues on it’s desired course while the masses quarrel over left versus right or the latest celebrity scandal. HOW CAN A HANDFUL OF PEOPLE CONTROL BILLIONS? Since the creation of the Federal Reserve, a number of highly secretive private organisations have been set up by the banking interests. The most notable of these are the Bilderberg Group, the Council on Foreign Relations and the Trilateral Commission. 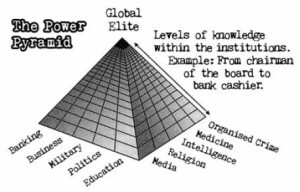 These organisations recruit people from positions of influence in the world and then reward them for loyalty and obedience to the agenda of the global banking elite. 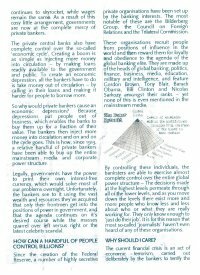 They are made up of the heads of global banking, politics, finance, business, media, education, military and intelligence, and feature Gordon Brown, Tony Blair, Barack Obama, Bill Clinton and Nicolas Sarkozy amongst their ranks – yet none of this is even mentioned in the mainstream media. 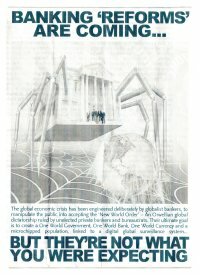 By controlling these individuals, the banksters are able to exercise almost complete control over the entire global power structure – The decisions made at the highest levels permeate through all of the lower levels, and as you move down the levels there exist more and more people who know less and less about who or what they are really working for. They only know enough to ‘just do their job’. It is for this reason that most so-called ‘journalists’ haven’t even heard of any of these organisations. 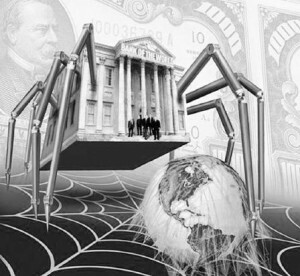 The current financial crisis is an act of economic terrorism, carried out deliberately by the bankers to terrify the public into consenting to a global currency and global central bank. sights set on world control. The first step is to surrender individual governments and currencies to superstates like the European Union – which is run by unelected bureaucrats working for the bankers, and now bypasses the authority of individual member governments. Barack Obama will soon attempt to usher the US population into joining the ‘North American Union’ – A merger between the US, Canada and Mexico, with a new currency called the ‘Amero’. Look out also for the ‘Asia/Pacific Union’ and the ‘African Union’. 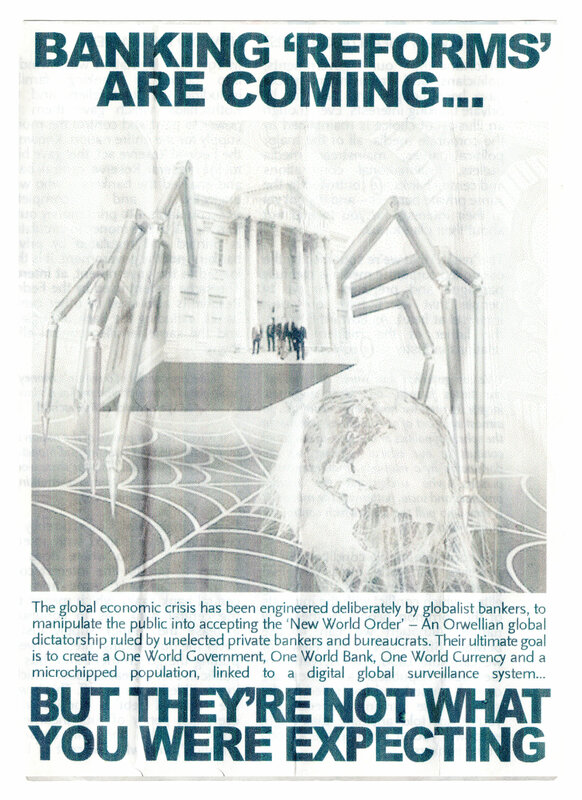 When all of the superstates – with their ‘super-currencies’ – are in place, the bankers intend to merge them all together under a global totalitarian government, with a global electronic currency, stored on a compulsory implanted microchip. Every single human on the planet will be chipped and connected to a digital global surveillance system – already being created under the guise of fighting ‘terrorism’. Every action will be monitored and recorded 24 hours a day, 7 days a week, from birth to death. You’re not expected to passively believe anything you read here. It may seem far-fetched at first, but please research this information with an open mind and decide for yourself. A good place to start would be to watch the following documentaries for free on Google Video or YouTube: Wake Up Call, The Obama Deception, America: Freedom To Fascism, Zeitgeist, Endgame, The Money Masters, Terrorstorm, Monopoly Men. 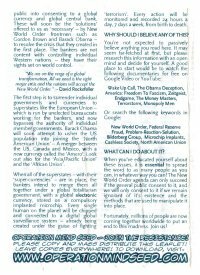 Or search the following keywords in Google: New World Order, Federal Reserve Fraud, Problem-Reaction-Solution, Bilderberg Group, Microchip Implants, Cashless Society, North American Union. When you’ve educated yourself about these issues, it is essential to spread the word to as many people as you can, in whatever way you can! The New World Order agenda can only succeed if the general public consent to it, and we will only consent to it if we remain ignorant of it’s existence and the methods that are used to manipulate it into place. Fortunately, millions of people are now coming together worldwide to put an end to this madness.